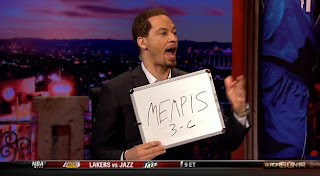 Say what you want about ESPN reporter Chris Broussard and his reporting and whatever, he is a spelling fiend. Except not really. That's pretty embarrassing but I have a feeling that Vice President Dan Quayle would enjoy that. Hell, ESPN should have those two spelling geniuses announcing the National Spelling Bee because who wouldn't love that? And Quayle would be relevant for a day. Everybody wins.